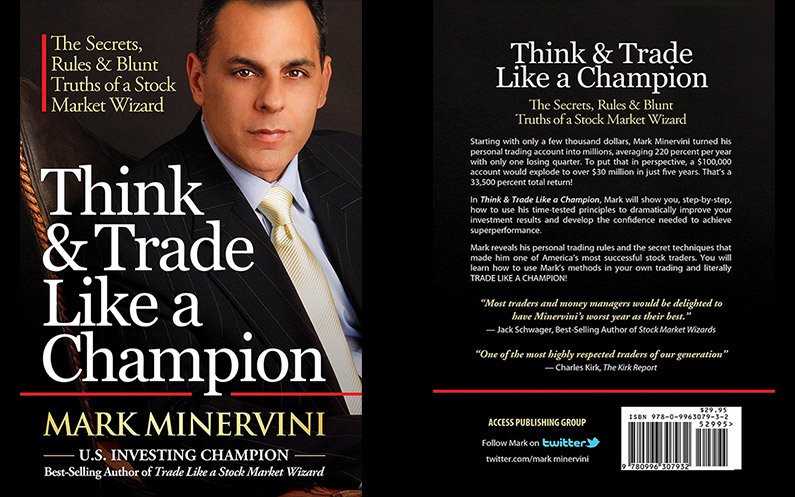 Mark Minervini just released his latest book, “Think & Trade Like a Champion”. When I first heard that Mark was going to release a new book last year, I got really excited. After all, Mark has succeeded in a big way where most have failed. And I enjoyed reading his other books, “Trade Like a Stock Market Wizard” and “Momentum Masters”. So I had high expectation for this new book. 1- Who Is Mark Minervini? 6- Who Is This Book For? In case you don’t know Mark Minervini, he is an independent trader who turned a few thousand bucks into millions of dollars. He won the 1997 U.S. investing championship with a cool 155% return, and from 1994 to 2000, he averaged a whopping 220% yearly return. That’s “only” a 33,500% compounded total return… He was also featured, along with many other trading legends in Jack Schwager’s “Market Wizards” book series. I had high expectation for this new book. I’ve read roughly about a hundred books on investing and trading so far and I must say that only a handful of those books are actually worth reading, in my humble opinion. Most of the investing/trading books you can find have been written by academics and other authors who actually never made any serious money in the markets. Well, after I finished reading Mark’s new book “Think & Trade Like a Champion” for the first time, I had only one thing in mind: to read it again, and again, and again. This book went straight to my top 3 trading books. Actually no. My top 2. It’s been a while since I actually learned something new from a trading book. Like his first book, this new book also starts with a great introduction that will supercharge your motivation and trading mindset. In the 2nd chapter, Mark reminds us about the importance of having a risk-first approach to trading and explains why cutting losers short is the most important element in trading. In the 3rd chapter, Mark dives into positive expectancy from a mathematical perspective. Chapters 6 & 7 are dedicated to Mark’s SEPA strategy. He delves into what he looks for before entering a trade. Chapter 10 covers 8 very important principles for success in trading that go against conventional wisdom. Finally, Chapter 11, is a great interview of Jairek Robbins (Tony Robbins’ son) in which he and Mark shared many practical tools for approaching the markets with a better mindset. This second book reveals even more the astounding degree of professionalism Mark Minervini puts into his trading. You often hear about always having a trading plan. Well Mark even has a disaster plan, in case something totally unexpected happens, like a huge gap down, a power outage, or if the Internet goes down. Evaluating all the different possible scenarios and knowing what you will do in each scenario will allow you to act rationally when under fire. I’ve been analyzing my past trades religiously every single year for the past 3 years. This is how I went from losing money year after year, to being able to make money consistently. Funnily enough, it is Mark’s interview in “Stock Market Wizards” that inspired me to do so. In his new book, Mark goes really deep into how to analyze your results, and all the different variables you need to monitor on a regular basis in order to make sure that you always keep a mathematical edge, a positive expectancy, based on your real-time results, and not on an hypothetical estimate. This part was just eye-opening… I’ve integrated this system right away into my trading process. I now not only fully understand how and why I’m profitable, but I now can know exactly when my expectancy starts to drift and when to fine-tune my risk management rules in order to always make sure I’ll make money. I think most traders just try to hit home runs. That was definitely my case. This allowed me to make a lot of money when I was right, which not only paid for my small losses, but also generated profits. However, I’ve never questioned my strategy. That’s until I read in this book a simple yet powerful fact: “8 trades that produce a 10% profit will more than double your money”. My own strategy is based on finding fat pitches, stocks that have the potential to go up at least 2 folds. Yet, it is much easier to find 8 trades that produce a 10%, than find one big trade. That is not to say that one should only aim for small wins. Because small wins can easily shift your expectancy from positive to negative. However, maybe, one does not need to only aim at fat pitches and could actually compound his money faster with smaller wins and higher frequency. He also finally wrote a most awaited chapter on position sizing which allowed me to improve my own strategy by increase my exposure and potential profits, without actually increasing my risk. However, there is one more thing I would have liked to see in that book. The book doesn’t include how Mark finds potential candidates, what screener does he use. Now that said, given the amount of secrets he reveals in this book, I can’t really complain. In all honesty, although it has been written by a master focused on swing trading stocks, this book literally is for every type of traders out there. 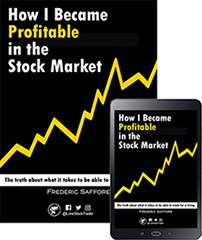 You may be a stock trader, or a forex trader, or an investor, day trader, beginner, professional trader, … Everyone will find something in this book that has the potential to turn you into a profitable trader, or to dramatically improve your performance. Again, I read a hundred books on trading. 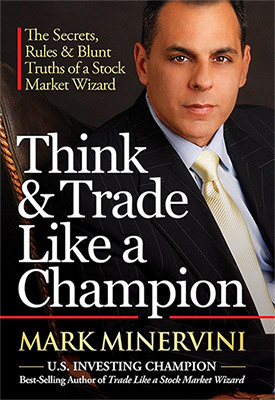 “Think & Trade Like a Champion” belongs my Top 2. I’ve now read this book 4 times already and I just can’t comprehend why this book is so cheap. Given the dramatically positive potential impact this book can have on your trading, the reward-to-risk ratio of buying this book is just incredibly skewed to the upside! My advice: BUY IT hand over fist!